Considerable cloudiness. Low 46F. Winds WNW at 5 to 10 mph.. Considerable cloudiness. Low 46F. Winds WNW at 5 to 10 mph. Alta Forest Products is the world's largest producer of wood fence boards, specializing in Western Red Cedar and other premium species found in the Pacific and Inland Northwest forests. It operates four sawmills across the region and directly employs more than 400 people. Alta is a daily purchaser of logs from sustainably managed timberlands owned by a wide variety of organizations - from large, industrial-scale timberland investors to small, local tree-farmers. In addition to producing fence boards and pallet stock lumber, Alta's zero-wood-waste sawmills produce by-products such as wood chips, sawdust, mulch and bio-fuel. Headquartered in centrally-located Chehalis, Washington, Alta operates fence board sawmills in four other rural communities in the region: Morton, WA; Shelton, WA; Amanda Park, WA, and Naples, ID. Alta’s fence boards can be purchased throughout the U.S. at home improvement retailers such as The Home Depot and Lowe’s, as well as through local fence installers who buy from Alta’s nation-wide network of lumber and fence materials distributors. 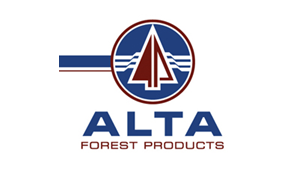 Alta Forest Products, LLC., A progressive, team-oriented, stable company that has been in business for 50+ years is seeking qualified applicants to provide assistance and support to the Log department. Two year college or Bachelor's degree preferred. Strong computer skills and accounting background is a plus.